The first Pollo Tropical opened in 1988 in Miami. Founders, and brothers, Larry and Stuart Harris opened the first location on 37th Avenue in Miami. In 1993, the company went public and started out offering 1.5 million shares. The restaurant chain is currently owned by Fiesta Restaurant Group. Fiesta is currently traded on the NASDAQ under the ticker symbol FRGI. You can find the Pollo Tropical application link below. In 1994, the company headquarters moved to Dadeland, Florida, where it is still located today. Now, the company has more than 180 locations, with more than 30 franchised locations outside of the United States. In the United States, you can find the restaurant in Florida, Georgia, Tennessee and Texas. Other locations can be found in Panama, Costa Rica, Puerto Rico, the Bahamas and many other countries. The restaurant serves Caribbean-inspired cuisine and is known for its open flame grilled chicken, which is marinated in a blend of tropical fruit juices. The menu also serves a variety of tropical dishes, like fried yuca and plantains. The chain also offers family meals for an easy way to serve your entire family. The menu includes a long list of sides and a few sweet desserts. As part of the restaurant industry, the company has a lot of competition. So to keep customers returning, the brand follows its core values closely. The brands 3,000 employees are always working with a positive vision, integrity and teamwork. The company also values putting in hard work to beat its competitors in customer satisfaction. Pollo Tropical careers span from entry-level to corporate. Corporate job opportunities will require someone who either lives in the area or is willing to move close to the corporate headquarters in Florida. The employment opportunities include positions in purchasing, accounting, information technology, marketing and finance. If any of these piques your interest, fill out a Pollo Tropical application today. Restaurant careers can be either managerial or entry-level. Managerial Pollo Tropical jobs include assistant manager, manager, and general manager. These career options will require more experience than entry-level positions, such as cashier or line cook. Entry-level jobs will pay around minimum wage with the chance for advancement to higher positions and raises. To start Pollo Tropical jobs, you must be at least 17 years old. As the restaurants are open from 10:30 a.m. to 12:30 a.m. every day, employees should expect to work night and weekend hours. Keep in mind that you might have to work outside of business hours to keep the restaurant ready for customers. While all jobs offer some benefits, Pollo Tropical careers offer a wide range of benefits. All associates are paid during their training, have flexible scheduling options and get either free or discounted meals. Qualified associates may also get paid time off, healthcare insurance options and 401(k) retirement plan options. The company also offers tuition reimbursement plans. Cashier – Cashiers need to be personable employees who can take food and beverage orders for customers and operate cash registers efficiently. Cashiers should be willing to clean and help out in the kitchen if necessary. The wage for cashiers is generally minimum wage with the opportunity to earn more with experience. Line Cook – The responsibilities of the line cook are to help get food properly prepared according to company recipe and out to the restaurant patrons in a timely manner. Working as a line cook may mean that you need to help clean the kitchen and wash dishes. Line cooks generally start out earning minimum wage. Manager – The managers’ duties are to create work schedules, support company promotions, order products and supervising employees. Managers need to be willing to help the kitchen staff if the restaurant is understaffed, and they may need to run a cash register. This position will require previous management experience. Salary is generally near $50,000 for this position. Assistant Manager – As the right-hand man to the manager, the assistant manager needs to be able to supervise employees in a manager’s absence. Assistant managers may need to help in the kitchen or clean the dining area to keep the restaurant running as smoothly as possible. Assistant managers make a salary of about $38,000 a year. Do you have past restaurant experience? This question helps the hiring manager understand what you will already know about the restaurant industry. If you have worked in the restaurant business before, you will be a step ahead of someone without experience, which means you will need less training and easier to hire. What qualities do you think you can bring to our team? Each person is unique and will bring different traits to the team and the work environment. If you can bring something to the team that will either boost morale or add to the progress of the team, you will be a valuable asset to the group. In what ways would you handle a difficult customer? Customers are very important to the company, so even the most difficult customers need to be treated with respect and kindness. The interviewer wants to see if you have what it takes to please a difficult customer without giving the restaurant away. Managerial applicants should expect to answer questions more geared toward their leadership qualities. Questions like “What is your preferred management style?” and “How would you help your team if the restaurant was understaffed?” These questions will help the interviewer understand what kind of manager you would be if you were to work for the restaurant. If you decide to apply for jobs at Pollo Tropical, you can either apply online or in-person. If you would rather apply in-person, you should know that there is no printable application for Pollo Tropical. Just as there is no printable application form, there is nowhere to download application form, either. This means to apply in-person you will need to go to a local restaurant and get a free application. 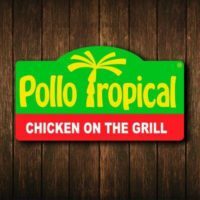 For those who would rather fill out a Pollo Tropical job application online, the website will walk you through how to apply for Pollo Tropical online. Before you fill out an application form, you can also browse all the open Pollo Tropical jobs online. You can then read a job description for each posting. Regardless of how you decide to apply, you should always fill out a direct application and include a copy of your resume. You should expect to hear back from the company within a month. This gives them time to review all the applications and call people in for interviews. If you apply in-person, you may hear back sooner than those who filled out an online application. If you are called in for an interview, you should prepare yourself before you go in by researching the company and knowing your answers to a few common interview questions, a few of which you can find above. Other than that, you should show up looking nice and being well groomed, as you will have to be well-groomed to work in the kitchen area.